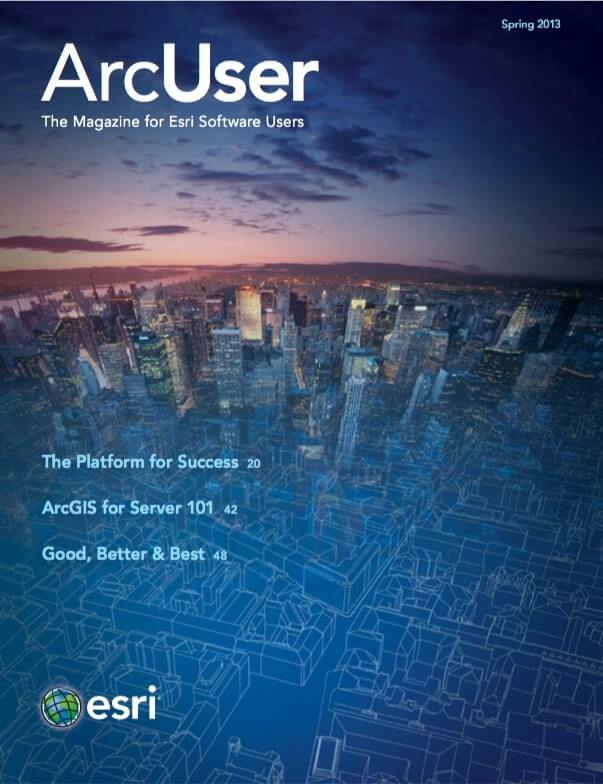 ArcGIS is becoming the platform for the organization. ArcGIS is at a turning point. It is becoming the platform for the organization. According to The Age of the Platform by Phil Simon, “A platform is an extremely valuable and powerful ecosystem that quickly and easily scales, morphs, and incorporates new features, . . . users, customers, vendors, and partners.” It is ubiquitous and tolerant of change. Platforms are all about communication: they help people connect with each other, businesses communicate with customers, and governments stay in touch with citizens. The platform ecosystem is open so it can work with complementary technologies and constantly expands existing capabilities and adds new ones. It must be agile and “plastic” enough to respond to new opportunities, many of which are generated by the application of business intelligence to various aspects of operations from customer service to supply chain management. Applications, based on the Local Government Information Model, can be downloaded at no cost from ArcGIS Online. They help organizations realize benefits from GIS data they already have. ArcGIS has evolved into a platform with an architecture that encompasses technology, information, and business layers. Beyond supplying innovative GIS in its technology layer, the ArcGIS platform provides the data and models in its information layer and targeted solutions, templates, and workflows in its business layer. The work of traditional GIS in organizations is enhanced and amplified, not replaced, by this platform. Unlike railroad and telephone companies that, in the past, dominated because they were monopolies, platforms like Amazon are tremendously powerful because they work cooperatively with other companies. The power of GIS has always come from its emphasis on collaboration, integration, and communication. The difference now is that, as a platform, the scale of collaboration and integration has increased, enabling much broader and more direct communication and interaction. Community Analyst is a web-based solution that provides analysis and mapping of thousands of demographic, health, economic, education, and business data variables, packaged with analysis functionality that meets business and organizational needs. Since its inception in the 1960s, GIS technology has changed with the larger trends in IT, moving from mainframes through mini-computers, workstations, desktops, client/server networks, and web servers. With the move to the cloud/device architecture, technological foundation for GIS changed more dramatically than at any other point in that long road. This change has been the most disruptive but, using ArcGIS, provides GIS professionals with an opportunity to reach a much larger group of geoinfo consumers in their organization. This new platform architecture brings together the familiar components of the enterprise GIS system—desktop and server—with pervasive applications that make GIS technology available to all kinds of clients through the cloud. ArcGIS Online, the cloud-based system for creating and sharing maps and geographic information, is the infrastructure that leverages the change to the cloud/device paradigm. From an initial inventory of basemaps, it has grown to thousands of maps, applications, tools, and layers that can be shared selectively or with the public. The ArcGIS.com map viewer provides simplified mapping that people with no experience with GIS can leverage. It has unlocked the benefits of GIS to a whole new set of users while supporting and extending enterprise GIS systems. The integration of ArcGIS Online supports everyone in an organization through readily available tools, applications, basemaps, and operational data that enhance collaboration; improve communication; break down information silos; and support more informed decision making that can be accessed not only by GIS professionals but by knowledge workers, managers, policy makers, and staff, whether on-site or off-site. With hosted services through ArcGIS Online, making these resources available inside or outside an organization no longer requires installing and maintaining a server. 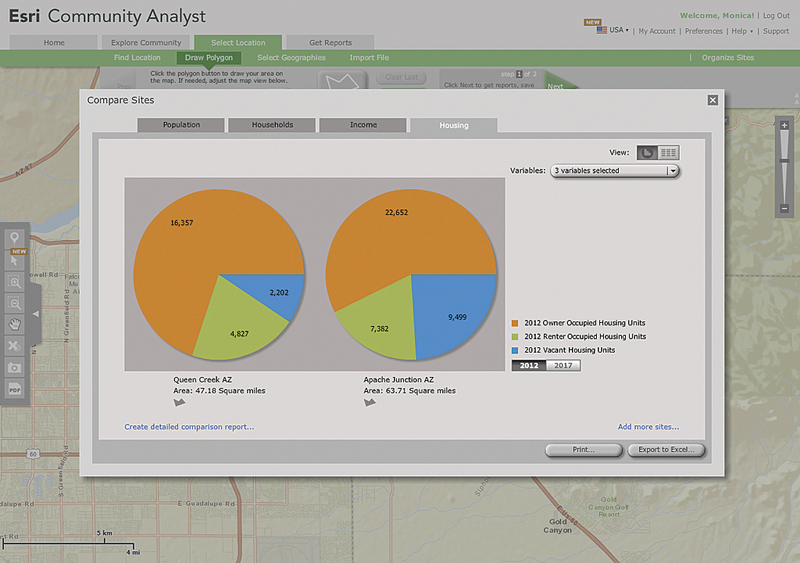 Solutions like Esri Business Analyst and Community Analyst can generate illustrated reports of the results of analysis. This new GIS pattern is exemplified by the work of the European Environment Agency (EEA). The agency uses GIS to meet the challenge of monitoring the quality of data about the condition of the environment of states in the European Union. EEA transforms terabytes of data into information that guides policy makers in these countries. Online content from ArcGIS feeds more than 80 maps and applications that enable integration of authoritative, citizen scientist, and crowdsourced data that can be contributed and shared in 32 languages. One defining characteristic of ArcGIS as a platform has been the adoption of the web map as a new pattern for finding, combining, and using content and functionality. It is not a departure from or replacement of traditional GIS work but a method for extending the value of the GIS work already done within an organization or by other organizations in a shared environment. What is a web map? It is simple to use but not a simple thing. It can be most usefully defined as a specification for a map that can be used by all Esri clients and on all kinds of devices. 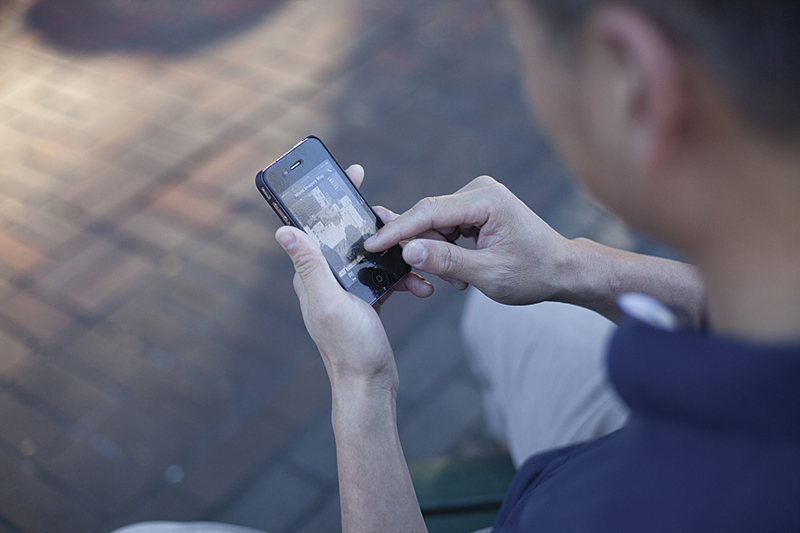 It is a way to capture tradecraft and share it. It can encapsulate analytics performed in the background or abstract distributed services. 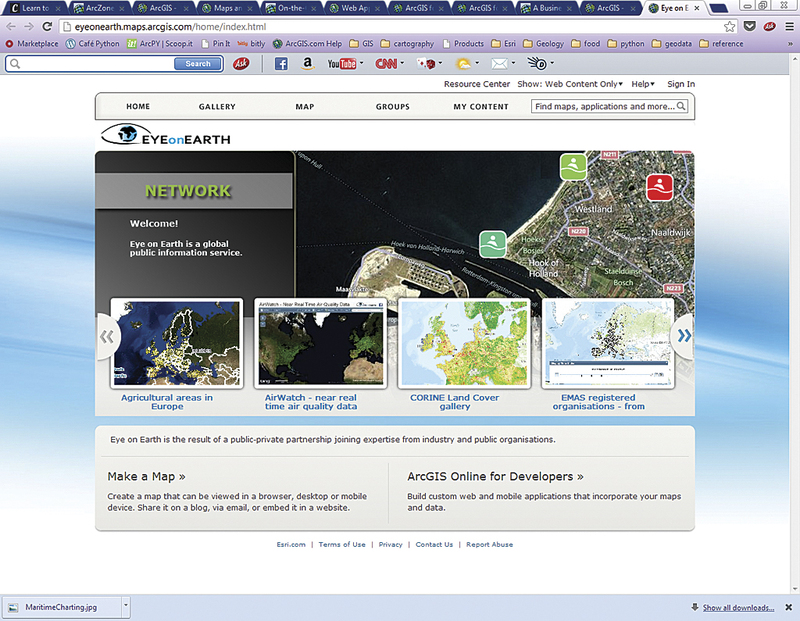 Web maps can be used by the entire range of clients from desktops to iPhones. Map, feature, and image services available from ArcGIS Online, combined with basemaps and operational data using the ArcGIS.com map viewer, answer questions and provide insights without requiring GIS expertise. By allowing interaction with both a map and the data behind it, web maps can be used to crowdsource data. ArcGIS feeds more than 80 maps and applications produced by the European Environment Agency that enable integration of authoritative, citizen scientist, and crowdsourced data that can be contributed and shared in 32 languages. Web maps make the information contained in data layers come alive and generate new insights. Services hosted on ArcGIS Online or on an organization’s own machines running ArcGIS for Server can be combined with basemaps or other types of operational data and persisted in a web map that can be shared by saving it to ArcGIS Online or by e-mailing it so it can be viewed using any device. Web maps support visualization, pop-ups, queries, and analytics and can be used to edit the original data on the server. A shared map can become the basis for additional annotation or analysis. Story maps, a specific format for a web map, can reach new audiences. They combine web maps with web applications and templates to incorporate text, multimedia, and interactive functions to make maps that inform, educate, entertain, and inspire. Story maps can provide insight into an organization’s operations and plans. Esri provides a form that users can pour their own and shared data into to communicate a specific message in a manner that is engaging and compelling. Web maps tranform organizations by getting rid of organizational stovepipes and enabling collaboration. The World Bank, a cooperative of 187 member countries that provides financial and technical assistance to developing countries to reduce poverty, uses web maps to improve transparency, communication, and collaboration. The institute’s Innovation Team geocoded and mapped more than 30,000 geographic locations for more than 2,500 bank-financed projects worldwide under its Mapping for Results initiative, and all new World Bank projects are georeferenced. Development planners can track and deliver resources more efficiently and effectively and avoid work duplication. This publicly accessible data empowers citizens to follow the progress of projects and service delivery in their countries. Configurable templates and applications can enhance the value of web maps by giving rapid and valuable insights. 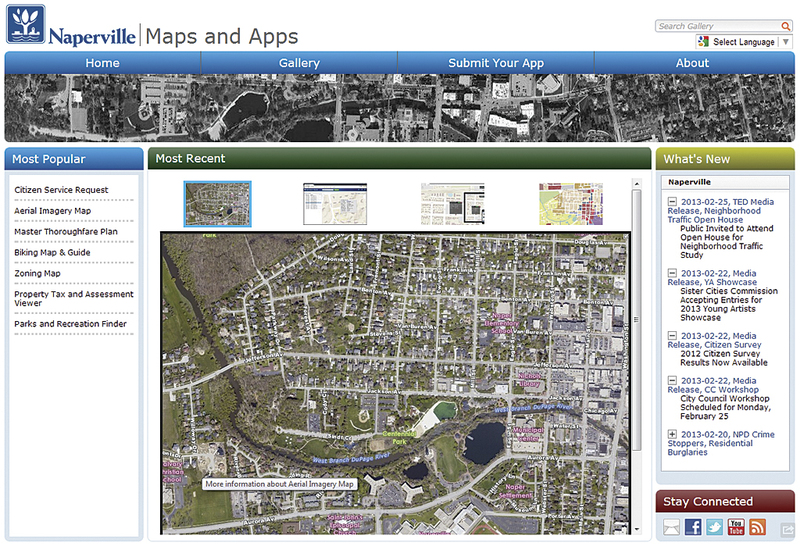 Existing web maps can be converted to web applications. An application available from the EEA website uses crowdsourcing to validate readings from monitoring stations on the quality of air and swimming sites. Feedback from citizens gathered using this application will be used to improve the quality of biodiversity, coastal erosion, and other types of environmental data. 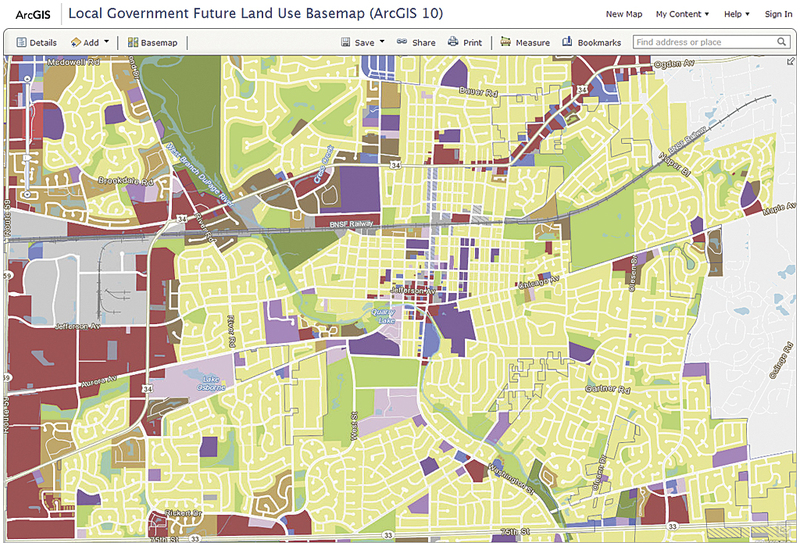 Organizations can use configurable maps and applications, such as this Local Government Future Land Use Basemap, to make their own data more useful and accessible with any programming. Many configurable applications that incorporated local data have been shared on ArcGIS Online. Applications, based on the Local Government Information Model, can be downloaded at no cost from ArcGIS Online. These applications help organizations realize benefits from GIS data they already have. “Better Than Scratch” in this issue describes how Lake County, Florida; the City of Fort Lauderdale, Florida; and Cabarras County, North Carolina, have met common web mapping needs using configurable applications from the Local Government Resources Center. For most GIS practitioners, the most challenging aspect of any project has been finding, vetting, and massaging data by normalizing, reprojecting, and harmonizing it. Although Esri has always provided data resources with software and worked for decades promoting and facilitating data sharing and reuse, the process was time-consuming and complex. Now access to authoritative content is much easier, and the requirement that users assemble all or nearly most of the data needed for any project is significantly reduced or, in some cases, eliminated. As its GIS technology continues to improve, Esri has also become a data company. ArcGIS Online makes accessible rich content that is constantly updated. This resource is a rapidly growing part of the ArcGIS platform. Ready-to-use, high-quality imagery, streets, shaded relief, topographic, and other geospatial data, as well as demographic data, is freely available from ArcGIS Online. Updated demographics, US Census, consumer spending, business, and marketplace data is included in some business solution products, such as Esri Business Analyst, or can be purchased separately. In addition to simplifying access to structured data, ArcGIS is coevolving along with other information technologies to deal with ever-increasing quantities of data from sources such as sensor networks, crowdsourcing, and the digitization of historic records. A world of two and a half billion people connected with devices is creating an explosion of sensor and behavioral data. The original Big Data technology, GIS is uniquely suited as the platform for organizing and communicating knowledge about anything on earth. 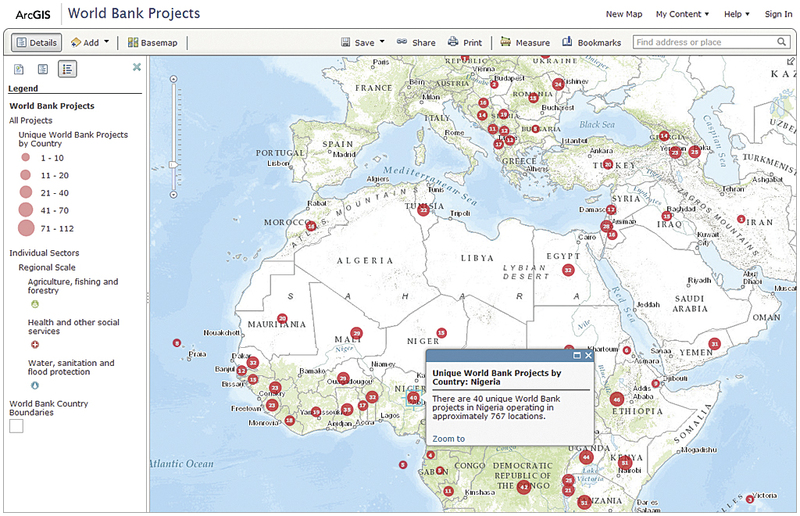 The World Bank geocoded and mapped 30,000 geographic locations for more than 2,500 bank-financed projects worldwide under its Mapping for Results initiative. 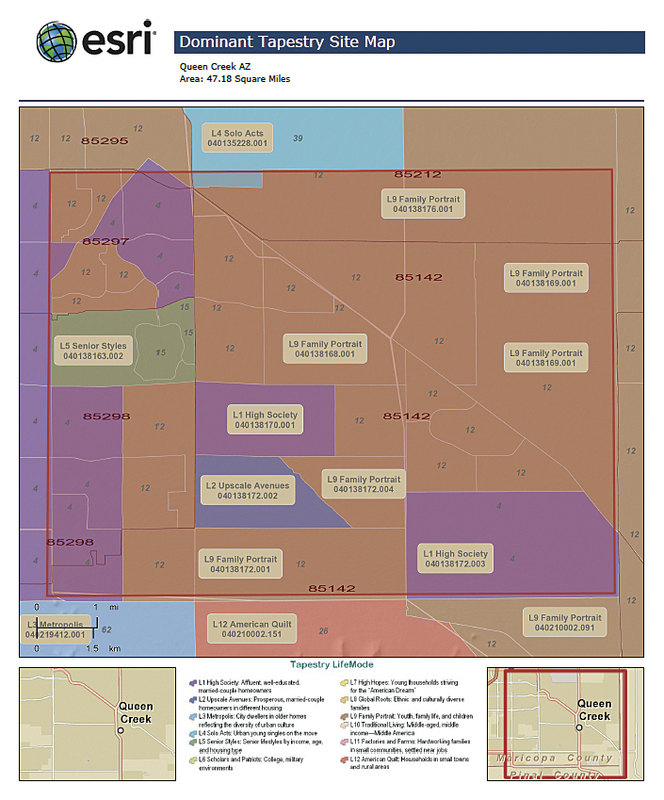 This map and many other maps and layers have been shared on ArcGIS Online. ArcGIS technology and information architecture are the foundation for the business layer, which targets organizational needs. The business layer enables people across the organization to accomplish work more efficiently and effectively. Organizations that don’t have the time or expertise to build a solution using Esri tools can benefit from GIS using Esri solutions. Solutions like Community Analyst, web-based technology that provides analysis and mapping of thousands of demographic, health, economic, education, and business data variables, package appropriate data with the functionality that meets specific business and organizational needs. Location has always been part of business analytics, often for site analysis and customer intelligence applications, but with the explosion of location-based data collected through smartphones and other devices, it is increasingly a source of competitive advantage. Esri location analytics software can provide invaluable insights to organizations and business. Location analytics is about dynamic, interactive mapping; sophisticated spatial analytics; and rich, complementary data. Esri Business Analyst, available as desktop and server and software as a service options, delivers data bundled with built-in analytical capabilities that support decision making. Esri Maps for IBM Cognos, Esri Maps for Sharepoint, and Esri Maps for Office directly integrate mapping with common business technologies. Some Esri solutions solve very specific problems. With Esri Address Coder, an organization can view the locations of US customers on a map and append latitude-longitude, FIPS codes, and Esri demographic and Tapestry Segmentation data to each record. Address Coder can use more than 100 of Esri’s data variables. Customers can be grouped by geographic location, demographic characteristics, or consumer type for targeted marketing. In the past, Esri supplied tools and some content that GIS professionals applied to solving problems at the project, department, and enterprise levels. Now, in addition to core professional GIS software that can be customized and extended with Python scripting and automated with ModelBuilder, the Esri technology layer has support for developers. Using Esri APIs and software development kits (SDK), developers can use just the analysis and mapping capabilities required to solve a customer’s problem while working in a mainstream development environment. 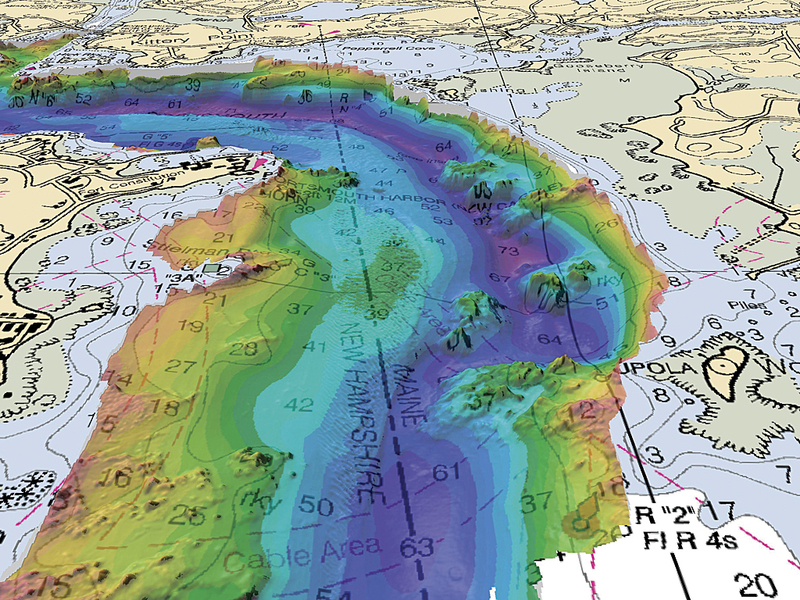 ArcGIS for Maritime: Bathymetry, an extension to ArcGIS for Desktop, helps manage and combine massive amounts of bathymetric data and metadata in a GIS environment. Another article in this issue, “The Year of the Developer: New program rolls out in 2013,” describes developer programs that will be unveiled at the Esri International Developer Summit March 25–28, 2013, in Palm Springs, California. New monthly ArcGIS Online pricing for developers and a marketplace for applications on the soon-to-be launched developers.arcgis.com website will be a one-stop site for the development community. Esri holds Meetups for developers across the United States and participates in events such as the Foursquare Hackathon held in New York City in January 2013. Esri will also sponsor hackathons at the Developer Summit and South by Southwest (SXSW). The evolution of ArcGIS to the platform is changing organizations even more profoundly than adoption of GIS on the enterprise level did. It enfranchises the entire organization, breaking down the barriers between workflows, departments, and disciplines. Sharing data and collaboration using geospatial information have become much quicker and simpler. With web maps, applications, and solutions, internal customers can use data from inside and outside the organization without knowing the underlying GIS technology. One effect of the adoption of cloud/device models for GIS is that the growing connectedness of the world makes the knowledge created through traditional GIS on desktops and servers accessible to a much wider audience. Consequently, rather than limiting the role of the GIS staff in an organization, that role is shifting and expanding into new areas beyond mapping. The work of GIS professionals has never been more important as GIS becomes ubiquitous. They provide the substrate that lets others benefit from GIS.